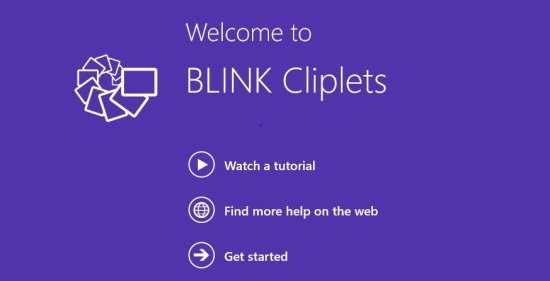 Blink Cliplets is a free Windows 8 Video Editing App; available in the Photo category of Windows Store. Convert your favorite videos to funny or exciting videos by creating layers in dynamic and static visual elements. 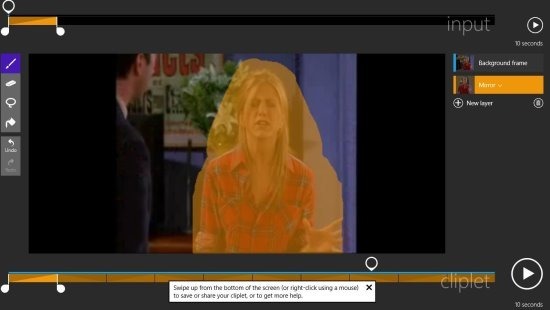 Just import short videos and create layers to choose which portion of the video should freeze and which part to animate. Share or download the clips that you have created and have fun. After launching the app, you can watch a small tutorial on how to use Blink Cliplets. In that video they will explain how to crop a video and how to freeze certain parts of the video. Let’s see how to use this app. Click on Get Started to create a animated video of your choice. Then you will see options for: Open a video, Record a video, and My projects. You can also get inspired by clicking on featured Cliplets or Gallery on the web to watch videos edited by others. Record a Video option is for recording a video with your webcam and then you can edit it in the app. Use the My Projects option to view the clips that you have edited before. Click on Open A Video option to edit the videos that reside on your PC; just open the folders through this app and add them to the editor. Once a video is added to the app, you will see the options that are shown in below screenshot. As you can see in the above screenshot, a small clip has been selected. You can drag the portion of the video to your desired timing. 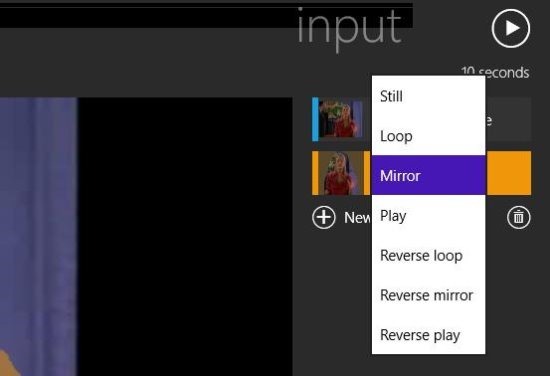 You can also set the starting and end point of the video clip, but only 10 seconds can selected. Apart from that you can rotate the video by clicking on rotate video option. After you are done selecting the clip, click on OK.
Now use the paint brushes and eraser option to paint the portion of video that you want to animate. You can use these options only after creating a new layer by clicking on New Layer. For example see the below image. You can also use the Undo or Redo options to go back or ahead of steps. Color only the video part which you want to play as it is. Rest of the video background will be frozen. You can animate the colored part using various options available under More. Once you are done editing the video, right click on video to change title and description, publish and share, or export. In publish and share you can share the video on your social networking sites or use the export option to download the video in GIF, MP4, or WMV format. You can record or edit videos that are already there on your computer. Share the created animation on your Social Networking sites. Download the clips in GIF or MP4 or WMV format. View various other creations in the gallery. Click on this link and from there click on View the app in Windows Store. Click on Install option in the app page and the app will be installed on your Windows 8 PC. Also try PhotoWhirl App and Photogram app for editing photos.